Of iPhones And Men - Hypothetically Speaking . . . Hypothetically Speaking . . . If you know anything about me, you know that I make a major life decision every September. Because I’m allegedly a responsible adult, I never take this decision lightly out of respect for the millions who have had to make this choice before me. You probably guessed it. It’s the decision of whether to get out of bed or not. But after making that judgment call, I then have to make a choice that I’ll have to live with for the next year or two. To upgrade, or not to upgrade my iPhone: that is the question. When faced with such a potentially life altering decision, I usually consult my team of shrinks and my grandma for guidance. Grandma once said that I could always count on her to be of assistance with life’s little dilemmas. Apparently, when she made that statement, she’d forgotten about her sleep schedule, which leaves me about 45 minutes each day when she is awake to offer support. Geez. When neither my grandma nor my team of shrinks are available, I take more drastic measures. That’s right, I pray to the ghosts of iPhones past for their perspective. I mean, it’s what any normal person would do. And although I use this option only as a last resort, I must say it’s refreshing to not have to worry about having to pay a copay like I do when I consult my shrinks or my grandma. At this point, my grandma only takes American Express. According to her, cash is so last season. 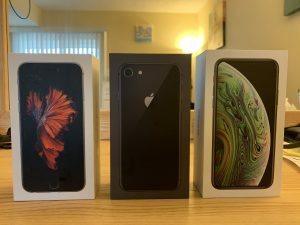 So, before you start judging and thinking I’m one of those Apple fanatics who takes off work and stands in line for several weeks just to buy a new phone, I am not—well, not anymore. My boss has firmly said she could no longer tolerate me calling out sick for three weeks every year. I countered her statement by telling her that the stores have Wi-Fi, so I could work remotely while waiting in line, but she rejected that too. Some people have no sense of what’s truly important. Honestly, I can’t really blame my boss for her lack of support. Last year, she took a slight issue to my being on sick leave when I could clearly be seen sitting outside the Apple store by anyone who passed by. It probably didn’t help my cause that I had done several interviews for the local news, and my picture was on the front page of the Washington Post showing my excitement as I waited. At the time, I was supposed to have been at the hospital with a ruptured spleen and a tattered heart. Perhaps I hadn’t really thought it through. No one goes to the hospital for a tattered heart anymore. Well, if you must know, I handled things much more reasonably this year. And by reasonably, I mean that I only waited in line for 3 days for my iPhone. Totally acceptable! Although I won’t go into details, surprisingly I only had to use the potty once the whole time. Since there were no restrooms, this gave me an opportunity to get creative. You’d be amazed at what you can accomplish by simply ducking behind an oak tree. More importantly, relieving yourself outside in the middle of a city block with nothing but a few leaves and two cigarette butts gives you a real appreciation for Charmin Ultra Soft. I assure you that the waiting wasn’t as bad as you’re probably thinking. Believe it or not, I’ve met some pretty interesting people while waiting in line. I won’t say any names in effort to protect the innocent, but this one guy named Harold Jenkins waited in line even longer than I did. According to him, he’d been standing there since 1942. If you had asked me to guess when he’d arrived, I would have thought 1960 at the earliest. Either way I admired his commitment. Because I consider the term “nerd” to be rather offensive, I won’t describe Harold in that way. Instead, I’ll just say that he was wearing a bow tie even though he had on a T-shirt. Oh, and maybe his glasses were a little on the thick side, but apparently that’s ok. Style gurus Anna Wintour and Miranda Priestly both told me thick glasses were coming back in style—especially when paired with the right pocket square and orthopedic shoes. The most interesting thing about Harold was the aluminum foil helmet he wore as we stood there. At first I thought it was a bit odd, but once he explained that he was protecting us from the aliens that walk among us, it made complete sense. Hey, safety first! He even makes his dogs, Socrates and Aristotle, wear the foil helmets for their protection too. Like Harold said, “When the aliens come, everyone is a target unless they are wearing proper headgear.” I immediately ordered one from Amazon. After what seemed like an eternity, the moment of truth came and the store finally opened. Even though the clerks said they were ready for us, we all stood back and let Harold go first to make sure the coast was clear. Although we had just spent several days with Harold, none of us felt like we could correctly identify whether the salespeople were aliens or not. In fact, I’m taking Harold with me the next time I go to visit my mother. She’s been acting weird lately, so I need Harold for a second opinion. Before long, it happened. I was presented with an iPhone Xs of my very own. Tears streamed down my face as I looked down at it in awe. It was so beautiful. At that moment, my maternal instincts kicked in. I immediately took my shirt off so we could have skin-to-skin contact. I’ve never been more proud in my whole life. It was then I knew that real dreams do come true. “I’m going to call you Charlie,” I said as I cuddled the most precious little thing I had ever seen. It’s been a few days since Charlie has been with me, and unlike what many blogs say, my iPhone sleeps right through the night. It probably helps that I use the do-not-disturb setting to make this happen, but that‘s neither here nor there. It’s amazing how I somehow just know when it’s time to plug little Charlie in and when to put on his leather case to protect him from the cold. I haven’t exactly mastered the whole nursing thing just yet, but as they say, “Rome wasn’t built in a day.” Eventually I’ll get the hang of it. I expect little Charlie and I to be really happy together . . . right up until this time next year . . . when I’m forced to wait in line with my foil helmet to trade him in. Hmmm.